The Ballsbridge Hotel is in Dublinâ€™s D4 district, next to the DART Railroad which connects guests to the centre of the city in minutes. Aviva Stadium and the RDS are also within walking distance of the hotel and the Aircoach stop is just outside the property. 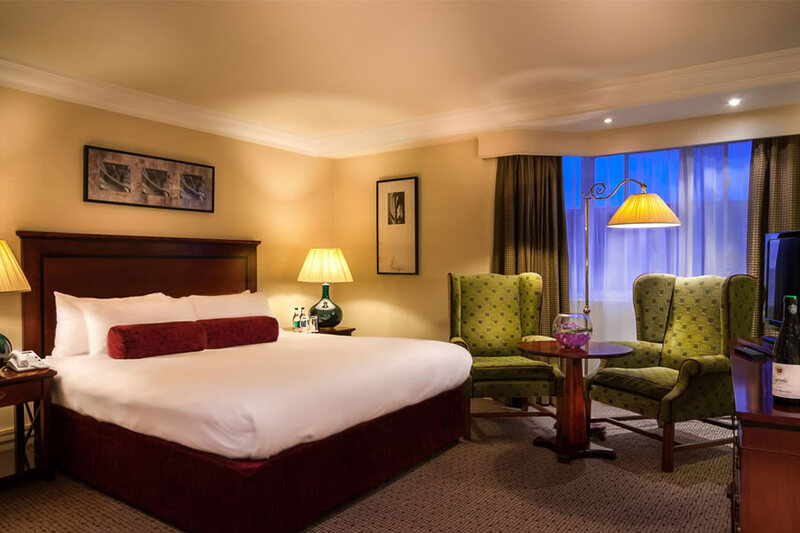 With private parking on site, the Ballsbridge Hotel is within easy reach of Temple Bar and Grafton Street, along with the Guinness Storehouse. My second time to stay here, I really like this hotel. You can tell in its day it was a very grand hotel. Rooms are big warm and clean. Staff are LOVELY. Food is 'normal' food not fancy stuff which means we always enjoy our dinner and breakfast, and they dont mind that Im Gluten free and that menu needs altering for me to pick something I can eat. Only downside is its a huge hotel so unless you come very early expect to queue for breakfast, we arrived at 10am and waited 20-30mins to be seated. Its about 7euro taxi fare into Graftin street, although you could walk it in 20mins id say. Five mature ladies stayed for overnight B&B on Sat 7th Dec 2013. Very impresssed with the hotel in particular the staff were very friendly and accomodating. Rooms were lovely and we had a lovely time having a few drinks in the bar. All would stay again. Lovely stay. Pleasant staff and wonderful food. Room very clean but too close to elevator to get a good night's sleep. Drinks in bar quite expensive. Would stay there again. We really enjoyed our stay at Ballsbridge Hotel, we were attending a function in the RDS so it was ideal, and it is also very central for City Shopping with good transport links.I could not complain about anything, the staff were very pleasant and helpful, the food was great, and the place was very welcoming. We had a beautiful meal in the Restaurant on one night of our stay, we will definitely stay there again. Having spent a night in Ballsbridge hotel, my second time there, I thoroughly enjoyed my stay. the rooms were fantastic, bed was comfortable and the staff were charming. great nights stay and we got a fantastic deal on the rooms. Have yet to eat in the hotel so I cant comment on the food. so good, will be booking again with the hotel for one or two nights in Dublin over Christmas. Lovely hotel and excellent customer service. I look forward to returning soon again. A great hotel , our room was beautiful , the staff were very friendly and helpful , We ate dinner at the hotel that night our meal was included and fantastic , Wonderful night would definitely stay there again , and its so close to ghe american embassy as we had a very early appointment . Great alround hotel ! Our stay was most satisfactory in every respect. The hotel's staff was particularly pleasant and friendly. Very comfortable stay ,huge family room,helpful and friendly staff,we had a lovely stay at the Ballsbridge hotel. This hotel is very central to everything and easy to find. The hotel however has a new part An an old part, the old part is a bit dated, in Need of some paint, the door in the room wouldn't Close correctly and we were our on a corridor with a tour Bus of visitors who departed the hotel very early the following morning And had us awake. Food was very nice Staff friendly You do unfortunately have to pay for parking. We stayed one night in the Ballsbridge Hotel and enjoyed our stay. The bedroom was roomy and very comfortable - the staff were very nice and the location was great as the bus stop was directly outside the hotel. We would stay again and recommend it to our friends. Very happy with my stay, staff very frendly and helpful, breakfast excellent. I will look forward to returning. Stayed in the family room, very spacious, Excellent value. Very convenient location, great selection at breakfast. Only downside is you have to pay for parking? Room was far larger than expected and bed was very comfy. Breakfast had an excellent selection and the dinner was perfect. Only minor gripe was that the shower was of the "taps in the bath" variety, which meant occasional adjustment was required to maintain a comfortable temperature. Good location & value! We stayed overnight B&B with an evening meal. The room was clean and a bit old-fashioned in style. It was a bit chilly and the wallpaper was torn in one spot. The bed was comfortable. Staff were very helpful and friendly & the service was very good. The food in the restaurant was wholesome and tasty. Excellent hotel, lovely staff. Great location. Great breakfast. Rooms are spacious and clean. Only little down point is that parking is charged extra and not mentioned when booking. Location was good but very dissapointed with room ... it was not very warm & room was very dated looking. Also, not too much parking available. Very enjoyable stay.Hotel was full and the staff coped very well. room and facilities were of a high standard.would stay there again. Wonderful atmosphere in the hotel. Our room was satisfactory the decor in the bath room was a little tired. Location perfect for shopping in the Capitol and the Aviva. Breakfast was really tasty. Have stayed here quite a few times but not impressed with latest room. Remote control for tv didnt work, water barely trickled out of shower. Up side, the breakfast is always good and its a lovely hotel, maybe i just got a bad room this time. Wont stop me from staying here again though, and its really ideal for Aviva stadium and the Dart. Excellent location, just 10 minute bus ride to city center. From airport, Air Coach drops you outside the door. Ideal for any event at the Aviva Stadium or RDS as both less than 5 minutes walk. Rooms very clean, staff welcoming and helpful, great bar and food...superb value for money, highly recommended. Staff were absolutely lovely but I felt so sorry for them having to work in such a poorly managed hotel. The night before the Dublin marathon our table of 4 was just one of several people dining in the hotel. The food was perfect but everyday seemed to be waiting a ridiculously long period of time to get their food. In fact they actually ran out of food as we had to change our order due to this reason! We were sitting near the cash register so we overheard several complaints regarding the wait. The phone and the hair dryer in my room were not working. On the plus side, very comfortable, spacious rooms, great breakfast, great location and couldn't complain in light of the fantastic value for a Dublin hotel. I stayed here with my wife and 2 children last week 1/11/12 and was pleasantly surprised with the 'new' Ballsbridge Hotel. The check in was speedy, friendly and efficient. The room was spacious, comfortable and clean/well maintained. The Bar area and staff were so friendly and accommodating and there was a genuine friendly welcome from the General Manager who took time to engage in conversation with my family. Breakfast was superb - maybe some larger teapots (just a suggestion!) and we were served by pleasant staff. There was a great atmosphere around the Hotel and we were offered excellent value for money. We will definitely be coming back to the Ballsbridge Hotel. Well Done everybody. Stayed here for one night with my wife and two children. Good location and close to the RDS and Aviva. On the face of it the hotel seems nice and most of the public areas are up to scratch. The family room was big and adequate, but tired looking and in need of a refresh. The net curtains were torn and the pull out sofa was so uncomfortable, we ended up with musical beds. There's plenty of room to have two doubles or 2 + 1 + 1 to call it a real family room. We decided to try the bar for lunch on the Saturday and were seated and handed menus pretty quickly in the almost empty bar. We asked for children menus and were told they weren't sure if they had a children's menu after several minutes of the staff not knowing what to do we decided to walk up the road to a local cafe. This also meant we ruled out the hotel as an evening meal option. Leaving the car park later the automatic barrier closed on the roof of my car, luckily I have roof rails. On returning I let reception know, but felt my feedback went unheaded. Breakfast was good the next morning and plenty of variety. Has potential, but needs to try harder on the basics. Nice clean hotel , Breakfast was only ok ,food in bar expensive and small quantity , not great for kids meals , had to pay 5.50 for ice cream.parking in hotel was 10.50 per night which is crazy .Staff were very friendly..
Got a free upgrade when we arrived. Room was beautiful, Very large comfy bed. Food was good. Breakfast was beautiful. Great value. Very happy with my stay the room was very spacious and nice and warm, checkin staff very nice to deal with, i booked a family room the beds were very comfortable and the room was also clean, Bad points could do with more towels and the fried breakfast was a bit on the dry side. Good points on breakfast theres plenty of other choices for breakfast so don't be afraid to book this hotel. I will be booking this hotel again in the future i have to say. Excellent trouble free service. Friendly staff and an excellent breakfast. Very convenient to the city. Would recommend, great value for money. Friendly staff. Good breakfast. Room was nice and clean with tea and coffee making facilities. Plenty hot water and 2 hairdryers! Only fault was that I needed to get taxi's everywhere...... which cost an extra 60 euro over the weekend. Reception staff did book taxis as needed for you, which was very helpful. Would stay there again in the future. Even though check in time stted 3pm, staff facilitated early check in too. Locaton was excellent, plenty of taxi available, bus stop across the road. Room was basic & clean. WiFi was € 7.50 if required, thought this was expensive as the majority other hotels give it free. Breakfast was excellent, great choice & variety. Bar food menu was very basic and expensive and the price of alcohol was also expensive. In general we had a lovely stay.